This protocol describes the detailed experimental procedure for stem-loop poly(U) tailed RT-PCR using SYBR Green I. The procedure begins with reverse transcription of poly(U) tailed total RNA, or small RNA-enriched RNA, miRNA, siRNA, etc. The cDNA is then used as template for real-time PCR with gene specific primers. You may need to modify this protocol if you use different reagents or instruments for real-time PCR. The stem-loop poly(U) tailed RT-PCR method described here is designed to detect and quantify sncRNAs, especially for miRNAs. 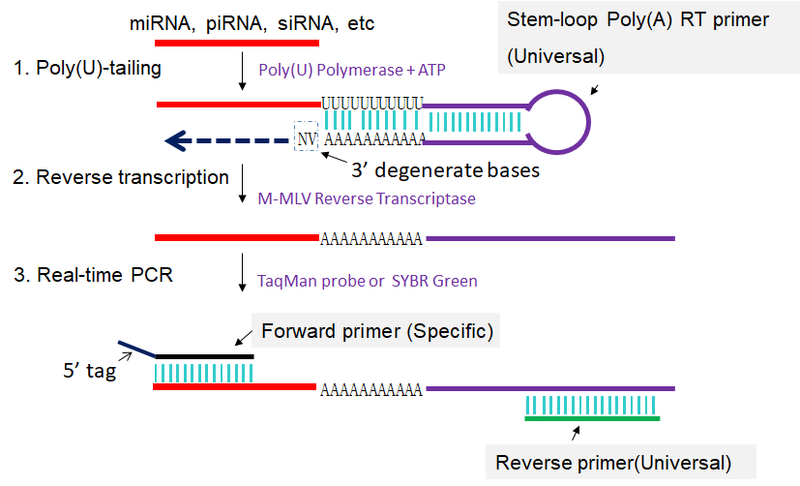 In this method, sncRNA of the same sample are polyuridylated and reverse transcribed into cDNAs using a universal stem-loop poly(A) RT primer and then used as templates for SYBR Green or TaqMan probe real-time PCR (Fig 1). The spatial constraint of the stem-loop structure of the modified RT primer allowed detection of sncRNAs directly from cell lysates without laborious total RNA isolation, and the poly(U) tail made it possible to use multiplex RT reactions of mRNA and sncRNAs in the same run (Mei et al., 2012). Fig 1. Scheme for stem-loop poly(U) tailed RT-PCR. 1: Poly(U) tailing of sncRNA using poly(U) Polymerase and ATP. 2: Reverse transcription of poly(U) tailed sncRNA primed by a universal stem-loop poly(A) RT primer. 3: First-strand cDNAs of poly(U) tailed sncRNAs are amplified in PCR by using specific forward primer and reverse primer complementary to stem-loop poly(A) RT primers. N stands for A, T, C and G, V stands for A, C and G.
Reverse Transcription is carried out with the Poly(U) Polymerase (PUP) and M-MLV Reverse Transcriptase (RNase H-) for RT-PCR. The following procedure is based on manufacturer’s protocol. 1. Mei Q, Li X, Meng Y, Wu Z, Guo M, Zhao Y, Fu X, Han W. A facile and specific assay for quantifying microRNA by an optimized RT-qPCR approach. PLoS One. 2012,7(10):e46890. doi: 10.1371/journal.pone.0046890.